In the age of digitization, various music streaming services are popping up and constitute fierce competition between each other, among which, Spotify, with 170 million active users, 70 million of whom are paying subscribers, is the most popular streaming music service around the world right now. Spotify offers almost everything that all of its competitors have. It provides Spotify users with a library of millions of songs and a massive number of playlists, podcasts, radio stations, and so on. On top of that, from its machine-learning and data sifting technology, Spotify analyzes your listening habits and builds out customized recommendations, such as playlists and music suggestions based on the genres and artists you’re listening to regularly. To a great number of people, Spotify is a one-stop shop for all music streaming wants and needs. 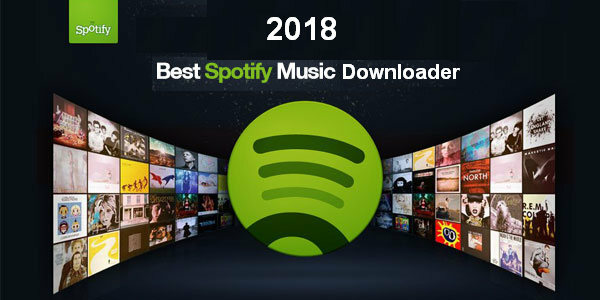 However, if you need to download songs from Spotify to your local computer, you may find that it is almost an impossible task. It’s the DRM adopted by Spotify and other streaming music service that prevents us from saving Spotify music as local files. As a result, we can find all kinds of Spotify music downloaders designed for downloading songs from Spotify to a DRM-free format in the market. 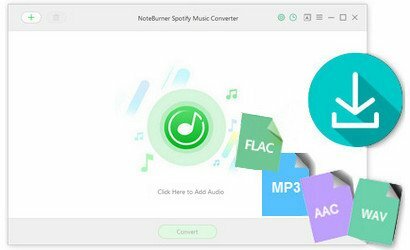 In this article, we are going to review the most popular one –NoteBurner Spotify Music Converter. Besides, you’ll learn how to download music from Spotify (Free) with the program step by step. Click "+" button on the upper left. 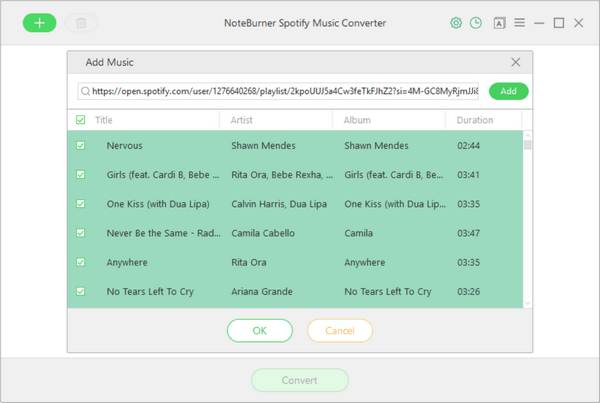 Simply copy and paste or drag and drop the song/ playlist link of your Spotify music from Spotify to NoteBurner Spotify Music Converter. Click "Settings" button on the upper right. Here you can choose output format (MP3/ AAC/ WAV/ FLAC), output quality (High 320kbps, Medium 256kbps, Low 128kbps), conversion speed (up to 5X), as well as the output path. 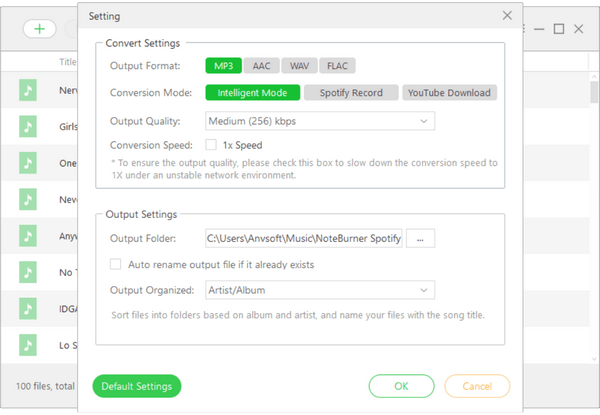 Click "Convert" button to start downloading songs from Spotify to local computer. When the conversion is done, you can find the songs by going to the output folder you customized in Step 3 or you can just click the "History" button (like a clock) on the upper right and then click the "Folder" icon to directly go to the output folder saving the songs. One of the factors to evaluate if a program is a good one is whether the program is provided with good after-sales service. 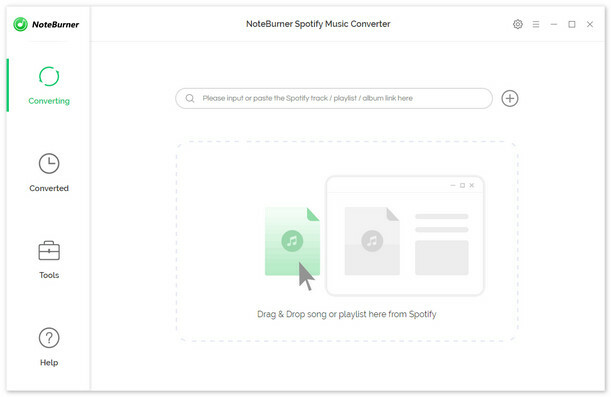 NoteBurner Spotify Music Converter promises life-long free updates and technical support. Should you encounter any problem when using the program, please contact NoteBurner support team at support [at] noteburner.com (replace [at] with @ before sending e-mail) for help. 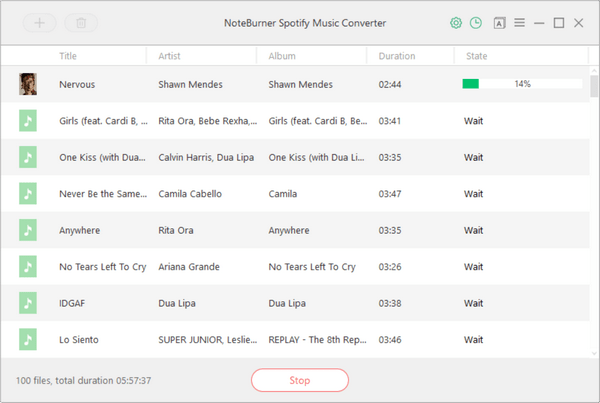 NoteBurner Spotify Music Converter is an ideal Spotify downloader if we are looking for a program to download songs from Spotify. The only reason that users may hesitate is that it’s a shareware instead of a free program. We advise you download the trial version first and then decide whether you want to apply the program with one time purchase at $39.95 but life-long free updates and technical support.